Lauren Scharhag: So long, and thanks for all the snark. So long, and thanks for all the snark. 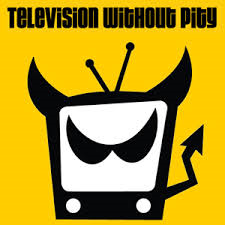 I found out over the weekend that Television Without Pity is closing down. The site will be shuttered as of April 3, while their TV discussion forums will be open through May. When I saw the notice posted on the site, I almost cried. My husband thought there was something wrong as he heard me from the other room moaning, “No, no, nononono,” over and over again. Articles on high-profile sites and magazines, as well as the Twitverse are all mourning the loss of TWOP. So am I. I also echo those who say that TWOP made me the writer I am today. I first discovered the site over 12 years ago and immediately got hooked on Buffy the Vampire Slayer recaps. I’d never read anything like it. They were these full-blown critical analyses. Of TV shows. And not just the show as a whole, but episode by episode. They were funny, sassy, exhaustive and thought-provoking. TWOP’s recappers brought literary sensibilities to pop culture, tempering the high-mindedness with a wicked sense of humor. I thought it was brilliant. Since then, I’ve visited their site nearly every day. I can't even begin to tell you how many hours I've spent reading TWOP commentary. It has irrevocably shaped my tastes in TV and film viewing. When I get hear about a new show, I immediately tune in to TWOP to see if they’re going to be recapping it. When a new season of my favorite show is about to premiere, I am equally excited about the prospect of new recaps to read, and forums to visit where people as passionate as I am about their entertainment will endlessly speculate, analyze, and dissect. Without it, watching TV simply won’t be as fun for me. I learned more about plot, pacing, character development and dialogue from their recaps and forums than I ever did in any writing class. Like many scribblers, I frequently checked the site to see if I could join their recapping staff—among the likes of Jacob, the Couch Baron, Aaron, Monty, Sep, Ace and Sars. Not only did the site have a profound impact on a generations of writers and critics, it affected the online landscape as a whole. Their phrases crept into our lexicon—snark, sexposition, HoYay!, and so forth. They hilariously nicknamed TV characters and created more cute neologisms and portmanteaus than you can shake a stick at. TWOP turned us into more discerning and demanding viewers. It even made viewers into participants in their beloved shows, providing a forum where show-creators were known to go so they could get direct feedback from their audience. Aaron Sorkin was famously known to frequent their forums, as did Rob Thomas and Rick Cleaveland, among others. Like other fans of the site, I, too, hope that TPTB will see fit to create an archive for the old recaps—which I still reread. Fare thee well, TWOP. As long as there are TV shows, there will be a Tubey-shaped void in my heart.